Authors:David R. Beukelman, David Beukelman Ph.D., Pat Mirenda, Pat Mirenda Ph.D., Laura Ball Ph.D., CCC-SLP Fager M.S., CCC-SLP Garrett Ph.D., CCC-SLP Hanson Ph.D., CCC-SLP Lasker Ph.D., Janice Light Ph.D., David McNaughton Ph.D. 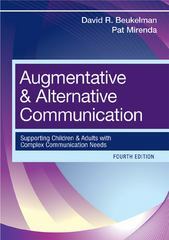 The Scribe students can sell Augmentative and Alternative Communication (ISBN# 1598571966) written by David R. Beukelman, David Beukelman Ph.D., Pat Mirenda, Pat Mirenda Ph.D., Laura Ball Ph.D., CCC-SLP Fager M.S., CCC-SLP Garrett Ph.D., CCC-SLP Hanson Ph.D., CCC-SLP Lasker Ph.D., Janice Light Ph.D., David McNaughton Ph.D. and receive a $27.00 check, along with a free pre-paid shipping label. Once you have sent in Augmentative and Alternative Communication (ISBN# 1598571966), your University of Bridgeport textbook will be processed and your $27.00 check will be sent out to you within a matter days. You can also sell other The Scribe textbooks, published by Brookes Publishing and written by David R. Beukelman, David Beukelman Ph.D., Pat Mirenda, Pat Mirenda Ph.D., Laura Ball Ph.D., CCC-SLP Fager M.S., CCC-SLP Garrett Ph.D., CCC-SLP Hanson Ph.D., CCC-SLP Lasker Ph.D., Janice Light Ph.D., David McNaughton Ph.D. and receive checks.